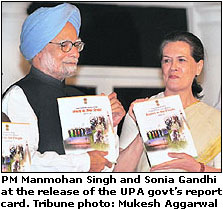 When the UPA allies lined up for the customary photo-op to mark its third anniversary, the group which held aloft copies of the annual report card listing the government�s achievements included two unexpected faces - Samajdwadi Party leader Mulayum Singh Yadav and Rashtriaya Janata Dal president Lalu Prasad Yadav. The Sikh dream of a separate register of marriages within the community is all set to be realised with Parliament today passing the long-pending amendment to the Anand Karaj Act 1909 that does not provide for such registrations. 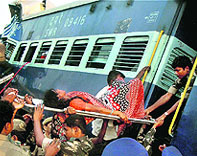 At least 25 persons were killed when the Bangalore- bound Hampi Express (train No 16591) crashed into the rear of a stationary goods train at the Penukonda railway station in Anantapur district of Andhra Pradesh early this morning. Twentysix persons were killed and 15 injured when a bus carrying Char Dham yatris fell into the Ganga at Byasi in Tehri district of Uttarakhand today. It was meant to be a CM's show at the Sher-i-Kashmir International Convention Centre, Srinagar on Monday evening. The fleeting interaction between US President Barack Obama and his Pakistani counterpart Asif Ali Zardari at the NATO Summit in Chicago on Monday served to underscore the frosty relationship between the two countries. No Bismillah Khan will face ignominy now and no Khan Mastan will die begging at the shrine of Haji Ali right in the heart of tinsel town Mumbai.